CCTV කියන්නේ බය විය යුතු දෙයක්ද ? University of Toronto , York University , Queens University, Brock University , University of Kansas Washburn University , MIT (Massachusetts Institute of Technology) , Harvard University, University of California, Los Angeles , Queensland University , යන විශ්ව විද්‍යාල වල CCTV තිබෙනු මම දුටුවෙමි. එකී විශ්ව විද්‍යාල වල සිසුන් වලට බිය නොවී අධ්‍යන කටයුතු කරගෙන යති. 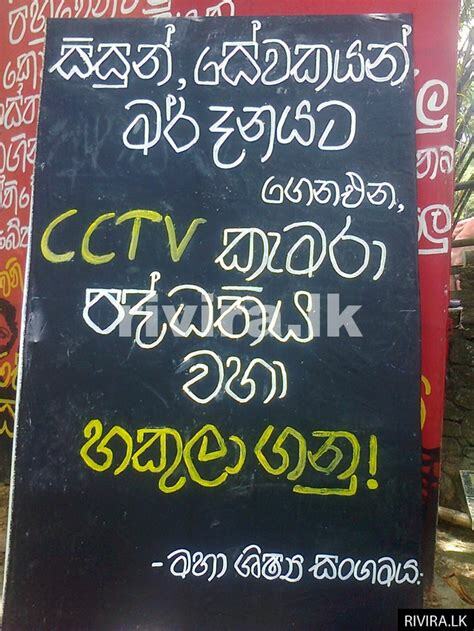 මොවුන් CCTV වලට බය ඇයි ? මහා ශිෂ්‍ය සංගමය කියන්නේ අශීලාචාර කටයුතු වලට සම්බන්ධ අය නිසා ඒවා හෙලිවෙනවට බය ඇති .